Alan Potter was born in Sedalia, Missouri. He received a Bachelor of General Studies (Anthropology and Creative Writing) from The University of Michigan, and a MFA in Painting from Eastern Michigan University. He began teaching at EMU in 1990. A swimmer glides past the eye that tries to hold it. It is this image, and the means and meanings of representing it, that I am exploring in my current paintings. I have always been interested in depicting the human figure at the juncture of representation and abstraction. Placing the figure in water allows for a natural development of this approach. 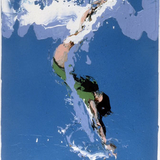 The figure will appear abstract, even if depicted in a strictly representational manner, due to the distortion caused by the currents and reflections in the water. A camera would confirm this, but only with a mechanical record. I am more interested in the subtleties and complexities of the human experience of such a scene. Without the aid of a camera, the eye alone cannot completely perceive the figure in motion. An image must be constructed in the mind through a fusion of vision, knowledge and memory. 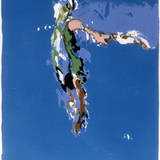 In this way, a brief glimpse of a living figure, swimming in water and light, becomes tangible, and can be represented in painting. It is this play between perception and art that allows the use of permanent forms to catch ephemeral moments. It is where the solid figure, dissolved in water, is captured by a liquid paint returning to its solid state.